Of course, '~이다' is followed by a noun ends with a letter with a final consonant whereas '~다' is followed by a noun ends with a letter without final consonants. Let this rule be (*) for reference. For example, '이건 트럭이다' which is correct whereas '이건 트럭다' which is wrong. Another example is '이건 버스다' is correct whereas '이건 버스이다' which looks somewhat strange. The following is the first question. Question 1: Is the sentence '이건 버스이다' wrong? Especially, in academic writing, '~다' seems to be avoided. For example, in almost all mathematics textbooks in Korean, we see a sentence like '이것은 함수이다' but not '이것은 함수다'. 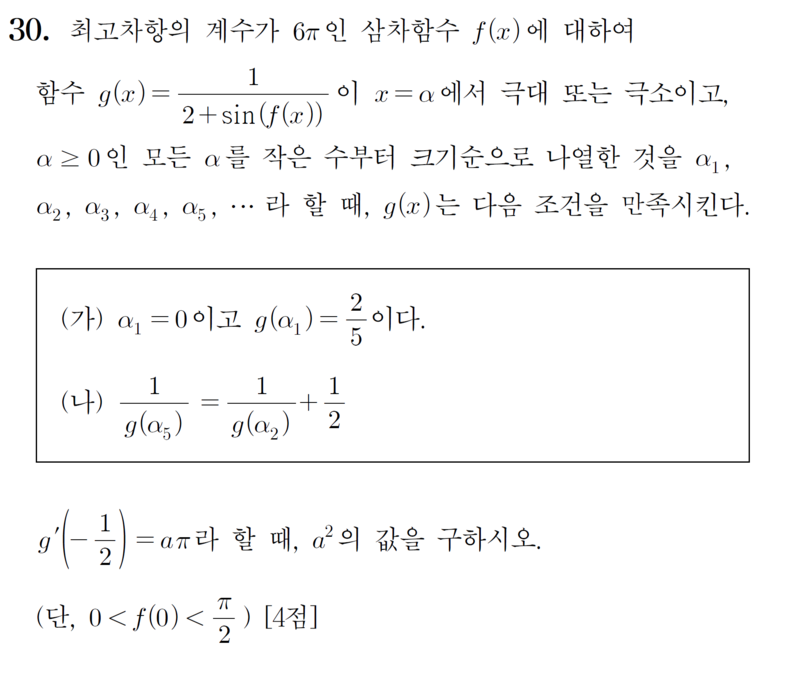 The figure following is the final question of math type 가 of 대학수학능력시험(something like Korean SAT). We can see the phrase '극소이고' which should be '극소고' according to the rule (*). Question 2 Is the rule () correct? If it is correct, should we write '극소고' in place with '극소이고'? If the rule () is not correct, is there any difference between '극소고' and '극소이고'? Can we say which one is recommanded? You have to use “-이다” after a consonant. You have to use “-다” after a vowel. You have to use “-이다” after consonant. You may use either “-이다” or “-다” after a vowel. “-이다” is the basic form. Sounds formal, because you do not elide the “이” when you can. Used in academic or formal writings, often in the indicative mood. Question 1 | Is the sentence “이건 버스이다” wrong? No, it's possible construction. Doesn't sound off, but sounds like you're saying a proposition. Question 2-1 | Is the rule correct? Question 2-2 | If the rule is not correct, is there any difference between “극소고” and “극소이고?” Can we say which one is recommended? “극소고” for everyday speech and writing, in your workplace, home, school, wherever. “극소이고” for academic writing, when you're describing your math questions. Not sure which to use? Stick to “극소고” and everything's good. Like you noticed, formal sentences in writings tend to use "~이다"/"~이고" over "~다"/"~고". So technically I think it's not wrong to say "이건 버스이다" but it sounds a bit strange. "이건": This is an extremely informal form of "이것은" so it's almost only spoken in verbal communications. "버스이다": Then there follows "버스이다", the writing form, trying to make the sentence formal. Question 2 Is the rule (*) correct? If it is correct, should we write '극소고' in place with '극소이고'? If the rule (*) is not correct, is there any difference between '극소고' and '극소이고'? Can we say which one is recommanded? The rule (*) is correct. Both "극소고" and "극소이고" are valid. But there is a little difference between the two. Q1: "이건 버스이다" does sound wrong. The copula ending "-이다" contracts and loses its 이 after vowels, so it should be "이건 버스다". The problem is that the rule you have is malformed. The rule defined as (*) is as below, just as you have written above. '~이다' is preceded by a noun that ends with a letter with a final consonant whereas '~다' is preceded by a noun that ends with a letter without final consonants. However, this does not extend to ~고 when with the copula, which is always conjugated as ~이고, ~이시고 in the present tense in formal written Korean, regardless of whether the noun before it ends in a final consonant or not. Not the answer you're looking for? Browse other questions tagged verb-endings or ask your own question. Is there any difference in meaning between the ~더라도 and ~도 verb endings? When to use -세요 and when -(으)ㅂ니다? What is the difference between -지 않다, -지 못하다, and -ㄹ/을 수 없다? Are ㄹ게(요) and ㄹ께(요) grammatically the same ending? Korean sentence ending that implies “Be careful! <X> might happen”? What does 다할 from 다하다 mean and what is '-ㄹ' after '다하'? What is the difference between 할래요 and 하고 싶어요?